The pump track is located behind the bathroom facilities near the tennis courts parking lot. It is the first installment of the skills area which will feature an intermediate and expert jump line when the project is fully completed. The pump track was built by Elevated Trail Design in coordination with the Tarheel Trail with grants from REI, Trips For Kids Charlotte, and State Farm. It opened in July of 2018, and is the biggest and longest pump track in the area, and is a ton of fun to ride. 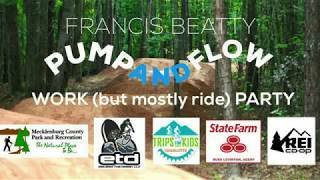 Beatty Pump Track Opening Day.